“Marusei butter sandwich” is the best and long-seller sweet product in Hokkaido where I was born. I was fascinated with the delicious rum & raisin cream even when I was a little child. I tried to remember the flovour and made the similar cookies. Yes, I think it’s close enough. But I miss my hometown after I’ve eaten few cookies. Place the butter and sugar in a large bowl and beat together until light and fluffy, then beat in the egg yolk. Sift together the flour, almond powder and baking powder into the butter mixture and mix everything until combined. Shape the cookie dough into a log, approximately 2 inches in diameter. Wrap in cling film and refrigerate about 2 hours. Unwrap the dough, slices into 0.2 inch thick and place on a baking try lined with baking paper. Bake in a preheated 180C/356F for about 15 minutes until golden. Leave to cool the cookies. 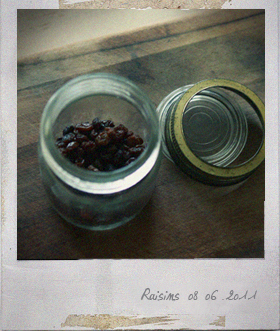 Place the raisins in a bowl, pour in the rum and cover with cling film, leave to soak at room temperature for about 2 hours. Set a bowl on top of hot water and melt the white chocolate. Let it cool down a bit. Place the butter in another bowl, beat until light and smooth. Add the melted white chocolate into the butter, mix them well. Add the rum-raisin into the bowl, mix everything together and leave the cream mixture until a little bit harder. Spread the rum raisin cream filling over half the cookies and top with the remainder. Refrigerate them for few hours until chilled. 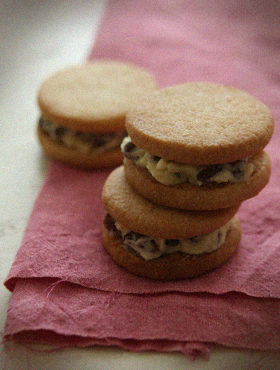 § 12 Responses to Rum Raisin Cream Sandwich Cookies"
Oops, Sorry! It needs to have 40g sugar. Thank you for pointing it out! May I know how long can I store them in e fridge? Thanks! Hi, after melting the white chocolate do I add it immediately into the beaten butter? For me I think the chocolate was too hot and it melted the butter which was previously beaten till light and fluffy. Should I cool down the chocolate first? This butter cream filling should be a quite thick (not fluffy) texture, but yes, it’s better to wait cool down the chocolate a bit first. Thank you for pointing out this method! Thanks for this recipe!! Been looking around for this recipe after trying it from a Japanese Bakery and finally found it! Gonna try making them tomorrow, I’m not really into the rum taste though, can I cut that part? Yes, you can cut the rum part or maybe it would be nice to use a few drops of vanilla extract instead of the rum. Hope you’ll enjoy the cookies tomorrow! Could you make these without the almond flour? I can’t eat nuts. Thank you for this recipe. I eat these from my favorite bakery in Japan and have been wondering how I was going to get this treat when I return back to the states! You are currently reading Rum Raisin Cream Sandwich Cookies at Fish Trip Cafe.